Silver Gallery offers machine engraving for many of our products. Please review the information below for details on our engraving services. Can't find an answer? Contact us at 800-582-7758 9am - 5pm EST Monday-Friday or use our contact form. We will engrave the text for your item exactly as you type it on the engraving form, so please keep the considerations and/or suggestions - provided below - in mind when placing your engraving order online and check your text before completing your order. Individual monograms appear as first name initial, last name initial and middle name initial, in that order. As an example, if the full three names were Justin Charles Morgan, the monogram would appear in the order of initials as JMC, with the center/last name initial M larger in the center. Marital or Couples' monograms, in which you would provide the bride's or wife's first name initial in the first name initial field, provide the groom's or husband's first name initial in the middle name initial field and the couple's last name initial in the last name initial field. This will create a traditional couple's married monogram. As an example, if the couple's names are Jane and Mike Doe, their monogram would be JDM. It is traditional for the bride's or wife's first name initial to be placed first in the monogram. When engraving a full name (or any other text), specify whether you want the name to be in all upper-case (capital) or in title case (upper- and lower-case) letters. Fancy fonts such as Double Script, Slanted Script, Shelley Allegro or Old English typically look better in title case, while block fonts such as Double Block or Roman 4-Line are fine either way. We do engrave logos! 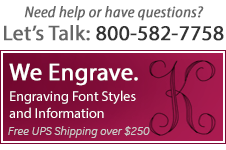 Please give us a call at 800-582-7758 Monday through Friday, 9:00 a.m. to 5:00 p.m. EST, to arrange your logo engraving. We are happy to assist you with your company logo or special artwork for engraving! We will need a suitable original file of your logo. We recommend providing an EPS version of your (vector) file if possible or - next best - a high-resolution TIFF or JPG version if the file is not vector-based. The quality of your logo or artwork engraving, on the item you choose, will be directly related to the artwork provided for conversion. It's best to provide a file with the highest quality digital artwork possible. The higher the quality of the digital artwork, the easier it is to convert the file to an engravable file, which cuts down considerably on the cost of the logo engravable file set up. Logos requiring cleaning up or alterations may be subject to additional charges. You may email your logo or artwork file to service@silvergallery.com when you are ready to place your order by phone, or if you would prefer, you may email the file for us for an estimate of your logo setup before you place your order.